* Stop #2 of my Burger Love adventure. 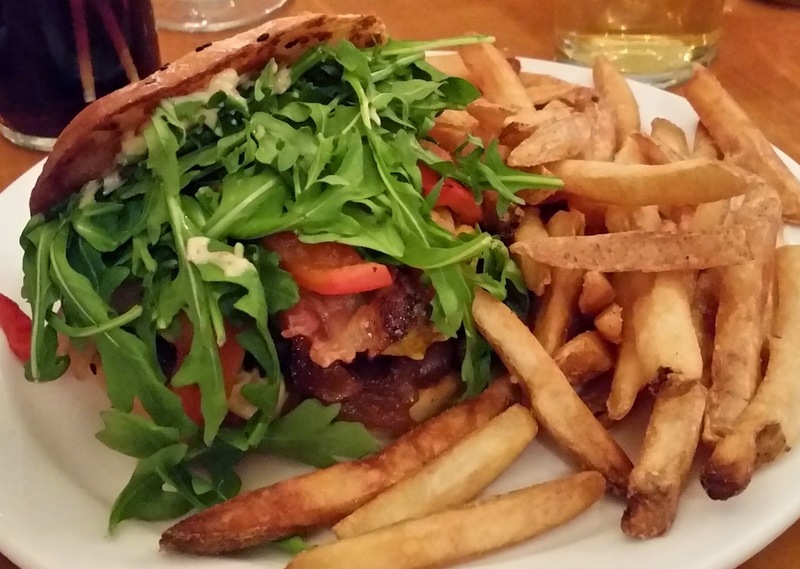 My 2nd burger this month was "The Acadiana" at the Loyalist Inn in Summerside. A single 6 oz patty seasoned with Southern Louisiana seasoning packed full of flavour, plus it was char broiled which added to the taste. It was topped with cajun remoulade, molasses cured bacon, cheddar cheese, fire roasted red peppers, crisp arugula, and red onion jam on a housemade potato roll with black sesame, toasted with butter. I was a little leery of this one as I'm not a fan of spicy foods but this one wasn't overpowering. It has a little bit of a kick to it but wasn't "hot" by any means. Great combination of flavours with none of them overpowering. The sweetness of the molasses cured bacon offset any heat from the remoulade and went very well together. As it was only my 2nd burger I didn't want to go too high with the score but I did enjoy this one over the Bad Boy. For now this one has set the bar at a pretty good level and other burgers will have some work to do to beat this one.